Community group Big Local Thurnscoe was delighted with the turnout last Friday for their Open Day following the refurbishment of 2 neglected properties on Grange Crescent in Thurnscoe. The sun was shining as the group welcomed local residents, Barnsley MBC Housing executives, members of nearby Big Local areas and MP John Healey to take a peek behind the doors and find out how much work has been done since the houses were purchased over a year ago. Assistance from BMBC housing team in tracking down absentee owners was invaluable in getting the ball rolling, and they also contributed a small grant towards the refurbishment in order to bring more local housing to the market in Thurnscoe. 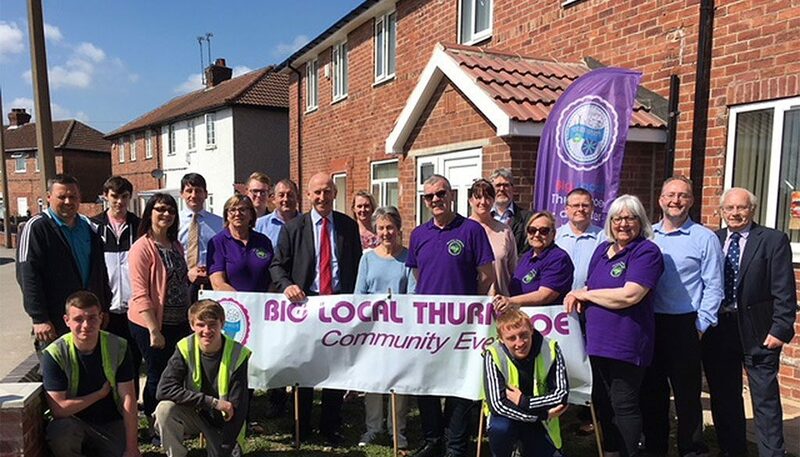 Big Local Thurnscoe then worked with their delivery partner for this project, Barnsley Community Build to tackle the huge amount of work needed to bring the houses back to a habitable condition. 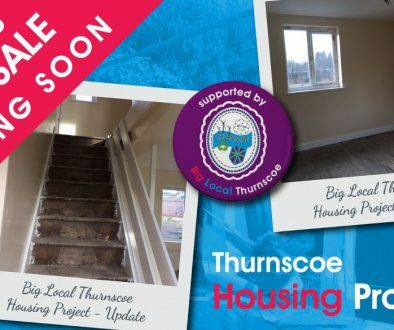 In addition to bankrolling the refurbishment, Big Local Thurnscoe were keen to support the development of local skills for young people and covered the costs of 2 apprentices to work on this project. In total, 16 apprentices have worked on this project and 4 of these have gone on to secure employment within the building sector. The houses were in such poor repair that it took several weeks to make them safe enough for trainees to enter at all, and since then they have been completely stripped back allowing experience with reinstatement of internal walls, plastering and the fitting of kitchens and bathrooms. Extensive work has also been undertaken externally, with trees being felled and new boundary walls constructed. To get them ready for sale, both houses have been painted and new carpets and blinds fitted throughout. 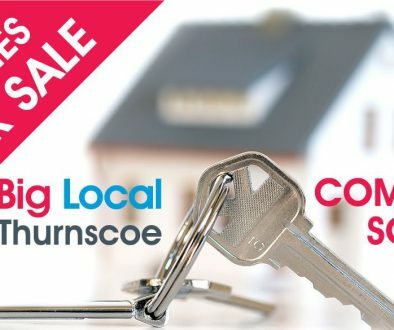 From the outset, local community group Big Local Thurnscoe had the intention to support the improvement of the housing offer in Thurnscoe. Last year they formed a Housing Sub Group to take this action further and explore the options. Since then, the group have carried out further consultations with housing experts and the wider community and the decision was taken to buy and refurbish 2 properties with a view to selling them and reinvesting the profits into further initiatives. ‘The great thing about Big Locals is that they’re all different. In Thurnscoe they’ve taken over two houses that were derelict, in disrepair and dragging the neighbourhood down. You’ve now got homes for local people, instead of an eyesore for those that live nearby it has improved the street and most of all this project has provided on-site training for apprentices and some of them have got jobs from it as well. Dinosaur Day – Phoenix Park, Sunday 20th May, 12-4pm	Big Local Thurnscoe’s first Dinosaur Day is a ROAR-ing success!